Animation is deeply rooted in the DNA of Viborg. A key factor is The Animation Workshop, Viborg’s well renowned Animation School. Over the last 25 years The Animation Workshop has evolved into one of the best, most well respected schools globally. The constant flow of knowledge, education, talent and productions makes Viborg a perfect place to establish a studio or a company, that works within entertainment, digital marketing or functional animation. Functional animation is a term coined in Viborg and covers the immense field of Projects, where animation is used for making complicated material understandable and accessible. Animation is used in a business environment or within a sector with special needs for getting the message across to the recepient regardless of gender, age, nationality or literacy. We strongly believe in the power of animation to clarify communication, to solve issues with knowledge transfer and in general as an important tool for creating understanding and results. Viborg Municipality has implemented animation in its communication with citizens, employees and stakeholders with great results. Follow the link www.animatingviborg.dk/en to explore some of the projects the municipality has been involved in. 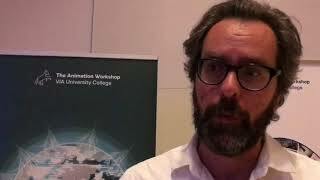 The strong relationship between the municipality, The Animation Workshop and the business community makes Viborg a unique partner, destination or home for all animation related activities.